Last summer’s surprise horror hit was 47 Meters Down (2017), a shark film from director Johanne Roberts, apparently in the tradition of The Shallows (2016), and, of course, Steven Spielberg’s Jaws (1975). The trailers and commercials suggested cheesy CGI sharks, and a minimum of nuance in the filmmakers’ approach. Even the movie’s first scene, with red wine spilled in a tropical swimming pool -- symbolizing the red blood soon to be spilled in the ocean -- intimates a juvenile or superficial approach to the familiar sharp-toothed material. 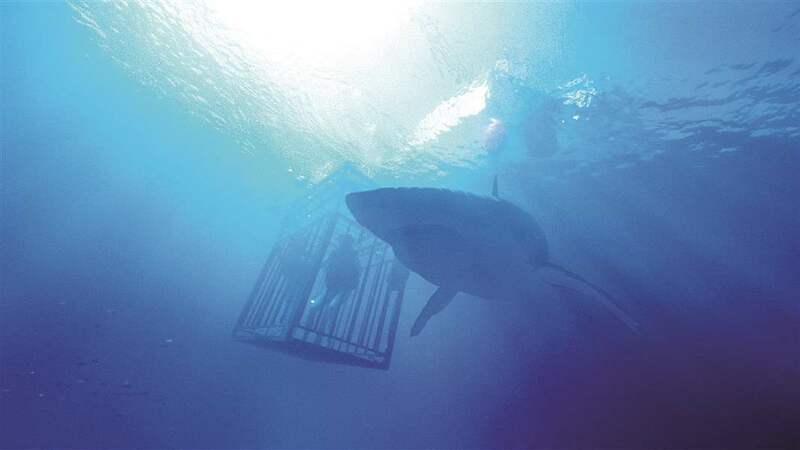 But as the movie progresses, and the film’s central scenario looms --- two young women trapped in a diving cage at the sea floor, 47 meters down -- a commendably high-degree of tension and suspense suffuses the film. And surprisingly, the sharks not only (mostly) appear real, but actually represent only one of many threats vexing the trapped duo. Rhe film also contends with shortages of air, trapped divers, abyssal trenches, and other jeopardy. And, delightfully, the film’s cheesiest moment -- desperate fingers scratching out a great white shark’s eyeball -- is earned by a well-prepared-for third act twist. 47 Meters Down wants to be both suspenseful (which it is), and gory (which it also is), and so the movie’s most outrageous woman-vs.-great white action is contextualized (without giving away the specifics) in a way that maintains the drama’s reality and sense of danger. Specifically, this twist concerns nitrogen narcosis. In terms of subtext or social context, 47 Meters Down tangentially concerns the fact that 21st century America -- the home culture of our beleaguered protagonists -- has become, in the words of author John Locke, an “autistic” society; wherein people are at ease with technology, but not with emotions, or each other. The film concerns sisters, Lisa and Kate, who never really talk, but who are finally forced to talk…at the bottom of the ocean. With suspense and shocks, and that nice grace note about how modern people relate in our technopol-istic culture, 47 Meters Down earns its gory stripes, and is worth a watch. American sisters Lisa (Mandy Moore) and Kate (Claire Holt) vacation in Mexico, but Lisa has been keeping a secret. She recently broke up with her long-time boyfriend, Stuart, and is still reeling from the end of the relationship. Kate and Lisa decide to drown her sorrows by clubbing and drinking, and meet up with two young men who not only have a romantic interest in the young women, but suggest an intriguing activity for the next day: a trip cage diving to see sharks. Lisa is not at all interested in seeing sharks from a cage, but Kate reminds her that they can take remarkable photos that will make Stuart jealous, and thus cause him to re-assess his decision to leave her; since Lisa is not “boring” as he claimed. Lisa acquiesces. The next day, the two couples board Captain Taylor’s (Matthew Modine) rust-bucket of a boat, and prepare for the dive. The men go down first, without incident. However, when Lisa and Kate enter the cage, the winch breaks, and the cage and its occupants plunge 150 or so feet -- 47 meters -- down to the ocean floor. There, Lisa and ate see their air supplies rapidly dwindle, and are unable to communicate with the surface. We live in an oddly narcissistic society, at present, and in some small way 47 Meters Down reflects that fact with the specifics of its narrative. A diffident young woman, Lisa, agrees to participate in an event she has no interest in (cage diving) solely because she will then have (social media) pics to make her ex-boyfriend jealous. Lisa overlooks her own feelings of “super-uneasiness" about the activity, and goes anyway. The error of her ways are quickly pointed out, however. Even before the action starts, the camera recording all these great social media pictures, is dropped from the cage, and lost in the sea. It falls into the open mouth of a great-white shark. So much for the selfies. I wrote a persuasive speech recently, about, of all things, how people adopt black cats at a low rate compared to other cats. You might think this is because of superstitions about black cats. That’s a piece of it, sure, but researchers have come up with another conclusion. They have determined that black cats don’t photograph as well as other cats, so those who use social media tend not to adopt black cats, or they bring them back to shelters, disappointed. I bring this up because 47 Meters Down offers oblique commentary on this notion of a narcissistic/selfie culture, both in Lisa’s ridiculous motive for participating in what is clearly a sketchy activity (given the rusted state of Taylor’s boat), and the final disposition of the camera. But also, importantly, Lisa and Kate have -- previous to this trip -- grown apart. Lisa thinks Kate is the perfect person: attractive, confident, and successful. She feels like she can’t compete with her. All she had, she believes, is her stable relationship with Stuart. Now that too is gone. When one gazes at research involving social media, reports suggest that frequent use tends to make people more competitive with their friends and family, and also, generally, less happy. In "real" life, Lisa has never confronted Kate about these emotions. These feelings did not come up . They did not come up over drinks, at a bar, or pool-side, but rather 47 meters down, while the sisters are trapped. The same “autistic” society is to blame. Up above sea level, there are too many distractions, and the sisters are not able to communicate except in cheesy post-card ways (a hug on the beach at sunset!) Under the surface, all the technology is gone, and the sisters actually begin listening to one another, and also fighting for one another. This idea isn’t heavy-handed, but horror movies universally reflect the way that we live "now." They tell us something about ourselves, and the things that we are scared of, as a people. Maybe we are scared, at this point, of connecting only to the “black mirror” of technology, and not our loved ones. I note this commentary because I think it adds to the value of the film, and makes 47 Meters Down more than the “shark attack of the week” movie. Impressively, the director of the film creates suspense here mostly from the air supply issue, not the sharks. 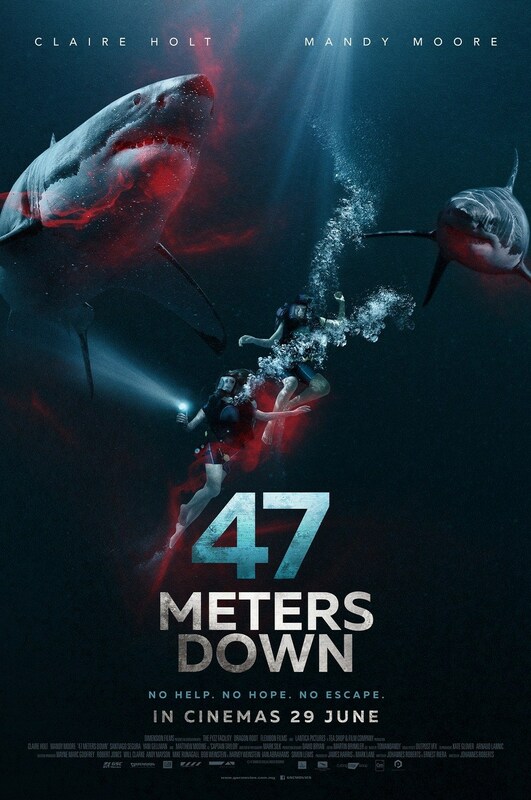 There are a couple of (good) jump scares involving the great whites, but from the first point that Taylor instructs Lisa in how to breathe to the very last scene of the movie, 47 Meters Down is really about trying to catch your breath. The women must acquire back-up tanks, and replace them, all underwater, while sharks swoop into view, lunging out from the opaque depths. Between Taylor’s instructions, and the constant checking of the air supplies (which get down to a reading of “01” at one point), the movie wrings the maximum amount of tension from the limited availability of resources. And just when the film threatens to go superficial -- wandering into Hollywood happy ending crap -- the makers of 47 Meters Down pull the carpet out from under viewers, and give their film a climax with all that more punch. Without spoiling it, you’ll be tempted to groan as one of the women is found miraculously alive (after a close encounter with a shark), and together with her sister, swims to the surface, decompresses in the water for five minutes, and successfully combats a shark. If played for real, this scene would pretty much ruin any sense of verisimilitude the movie constructs. Fortunately, the movie provides an explanation for this pie-in-the-sky “happy ending,” and proceeds to a coda that is dark and disturbing. conscious of what’s waiting for her outer there, in the dark water. Another scene of surprising power finds Lisa swimming towards a dropped flash-light when the ocean floor literally falls out from under her. She must swim out over an abyss, and again, the hungry sharks could be anywhere. The moment will give you a queasy stomach if you openly engage with the material and the characters. One might even choose to view the Nitrogen Narcosis sequence as another example of technology separating people from reality; from the connections around them. Lisa's cries, at the end of the movie “we made it!” are haunting for two reasons. One, they are fake news. And two: she completely believes them.